Online shop ping provides a level of convenience that can’t be matched by a brick-and-mortar location. Customers can order items from the comfort of their sofas, then wait for it to arrive at their front door a couple of days later. They don’t even have to get dressed or shower. Despite those perks, however, a recent study found customers still prefer the in-person experience to shopping online. In a survey, TimeTrade found that 85 percent of customers surveyed stated a preference for shopping in a brick-and-mortar location. This customer preference reveals a great opportunity for businesses to connect with shoppers and win their loyalty. Here are some tips that can help. Individual attention is important to customers, especially highly-coveted millennial shoppers. In the study, 92 percent of millennial participants specifically mentioned a preference for individual attention. If brands can work harder to connect with each customer in the store, they’ll be more likely to win a customer’s return business. 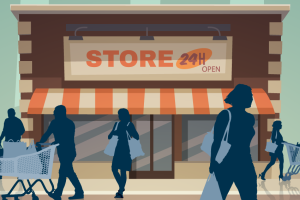 There are several ways businesses can connect with their in-store shoppers. The easiest way is to hire knowledgeable, friendly staff who can provide a level of information a customer couldn’t get by shopping online. Retailers can also provide personal shoppers or set shopping appointments to make sure when customers arrive, they’re getting a one-on-one experience. Showrooming is an ongoing issue for brick-and mortar retailers, since many customers now know they can easily compare prices using the smartphones they always have on hand. The best way to combat price comparison in any form is through finding ways to price competitively at all times. Through the use of price-matching software, businesses can remain aware of industry pricing to attract customers to spend with them. In addition to keeping prices competitive, brands should also price items based on what their own store’s demographics can bear. A store in a college town or working-class suburb might find that discounts and clearance sales bring more customers in than advertising that the season’s latest offerings have just arrived. Get to know your customers in a way only a brick-and-mortar store owner can. Brick-and-mortar stores will always struggle to compete with the convenience of online shopping. However, with studies revealing that customers still prefer the in-person approach to the electronic one, businesses can capitalize on this and win long-term business. With the use of price matching software like PriceManager, local shops can keep their prices competitive to beat the advantage some online retailers have in being able to reduce prices due to low overhead.